Nigerian Police Command in Enugu State on Sunday says it has arrested one Nnadi Daniel, a notorious armed robbery and kidnapping suspect in Uzo-Uwani Local Government Area of the state. 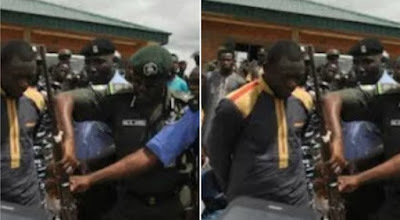 A statement by the command’s Spokesman, SP Ebere Amaraizu, stated that the arrest was part of ongoing onslaught by police operatives at Adani and Nimbo axis of Uzo-Uwani councils of the state to tackle crime in the state. Amaraizu noted that the suspect and other suspects were arrested through a well coordinated operation borne out of intelligence information. He said the suspect was implicated in the alleged kidnap and murder of Enechi Ejiofor and Emmanuel Okeja on Dec. 13, 2016 and Jan. 3, 2017. He also stated that the suspect participated in other kidnappings, robbery, murder, burglary, stealing and other vices that had taken place in the area and its environs in the past. He added that police operatives raided an identified notorious forest known as Malaysia forest through a well co-ordinated operation.